Is this what the Brooklyn Nets gear will look like????? TORONTO — The Nets will unveil their new logo and colors Monday morning in Brooklyn, at 10 a.m. at the Modell’s Sporting Goods store across the street from the Barclays Center, their new arena. But it appears the logo has already leaked out on the internet. On Wednesday, a photo of the logo was tweeted out by a person claiming to be a worker at the Barclays Center, andthe photo was picked up and run by Deadspin.com. The logo features the word Nets inside a shield above a white basketball with the letter “B” on it. 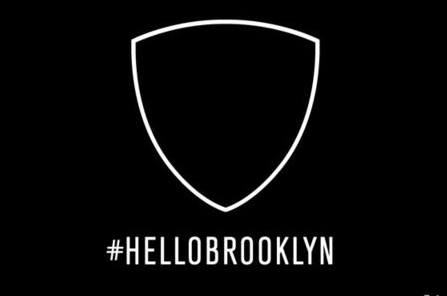 The team has posted the shield on its website since late Monday night, after the last game in New Jersey, and team president Brett Yormark refused comment on whether the leaked photo revealed the actual logo. The colors appear to be black and white. The Nets play their final game of the 2011-12 season tonight in Toronto against the Raptors. 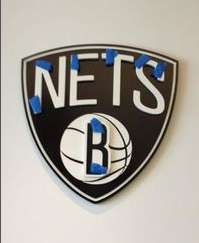 They have already moved their offices to Brooklyn, removed their banners and retired numbers from the Prudential Center in Newark, and will officially become the Brooklyn Nets on Monday. They begin play in Brooklyn next season. The Nets event & logo unveiling tomorrow! 11am at Atlantic Terminal Mall. CAN’T WAIT!